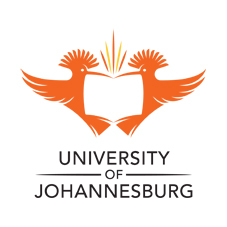 The University of Johannesburg (UJ) has unveiled its new brand positioning, developed with advertising agency Mortimer Harvey, with a fresh approach to its representation for 2014 and beyond. The new positioning aims to promote the University’s status as a leader in tertiary education and build its reputation for excellence globally. While UJ is well-established in its communications with undergraduates, it has now reached a stage of maturity that requires a different level of communication to a much broader audience. In the ten years since its establishment, the University has grown to include nine faculties, four campuses and almost 50 000 students. UJ is internationally renowned as one of the world’s leading research institutions and is ranked in the top 4% of universities worldwide. The new brand positioning – Art of Accomplishment – refers to the realisation of success through academic excellence. The campaign is focused on profiling the University and its alumni success stories, and communicating the ground breaking projects underway. Priority research areas of the University include Telecommunications Technology, Economic Geometallurgy, Energy and Sustainable Development, Nanotechnology, Water and Health, Aquatic Ecotoxicology and Sociological research. The campaign supports the strategic direction of the University, and builds on the success of UJ’s current reputation as a world-class teaching, learning and research institution with proven support structures and award-winning academic staff. The brand is already well-positioned among other global universities and is focused on innovation, growth and development. The University’s inclusion as the first and only African university in the prestigious Universitas21 research consortium is testament to its innovation and research reputation. “The creative philosophy for the new positioning campaign references the University’s global excellence and stature, with clean and sophisticated imagery that blends photography and illustration in a bold and modern way,’ says Gerald Harvey, Chief Creative Officer of Mortimer Harvey. The new creative approach falls in line with global advertising trends of visual communication with more considered illustrative techniques and a stylised and daring design. Typography is an integral element to the design and has also been carefully considered. The campaign includes a new twelve-page magazine that will be published every second month, with editorial, profiles and insights presented in a relevant and engaging manner. The publication will also be available in a digital format and will be supported with an interactive social media campaign. 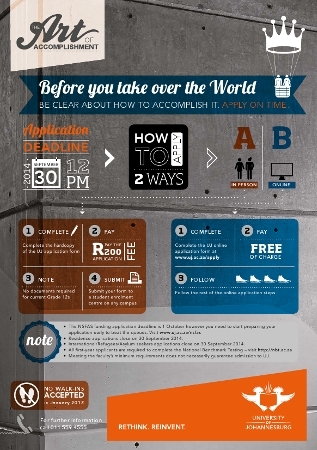 Application deadline for University of Johannesburg is at 12pm at 30 September 2014!